A discussion paper on “Virtual Currencies and Blockchain Technology” was published by the Department of Finance on 22 March 2018. The paper presents the Department’s recent research into virtual currencies and the blockchain ecosystem that exists in Ireland, Europe and globally. 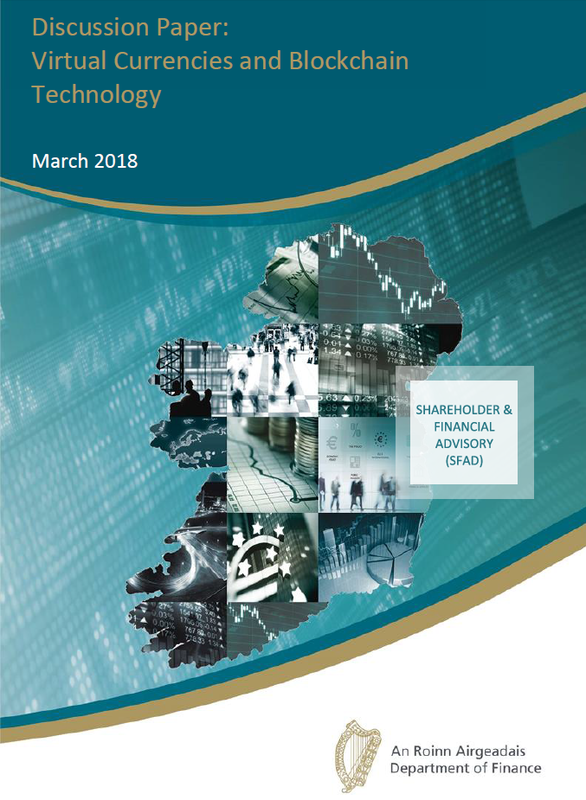 It provides an overview of the Irish and global virtual currency markets including a summary of the actions taken by selected countries around the world in response to virtual currency. The key risks that virtual currencies present to consumers and companies are examined: that includes consumer protection, EU Financial Services Regulations, data protection, taxation and contract law. The paper recommends that an internal working group is established to coordinate the local and global approach to virtual currencies. Monitor developments at European (i.e. ECB, EBA, ESMA, EC, EIOPA) and global level (i.e. OECD, IMF) in relation to virtual currencies and blockchain and provide input into the discussions as and when required. Maintain up to date knowledge of developments to identify risks and assess potential economic opportunities for Ireland. Engage with industry and subject matter experts in the private and professional sectors to build a dynamic communication flow. Liaise with other areas of Government to assess where involvement might be required. Consider whether suitable policy recommendations are required. Assist in promoting a better understanding of the area covered by the paper, across Government. Ireland is already home to a number of blockchain businesses, some of which have already attracted venture capital. There is some acknowledgement in the paper that blockchain technology presents an opportunity to assist in the delivery of IFS 2020 objectives by fostering growth in the technology sector, while supporting indigenous companies and is assisting to secure foreign investments. Click here to view the Press Release and here for the Discussion Paper.